Be the first to share your favorite memory, photo or story of Elizabeth. This memorial page is dedicated for family, friends and future generations to celebrate the life of their loved one. Elizabeth Ann Tegen, 88, Kennan, died on Wednesday, April 3, in the Aspirus Pleasant View Nursing Home in Phillips. She was born on July 22, 1930, in Kennan, Wisconsin, the daughter of Jesse and Hattie (Doughty) Winter. She was a graduate of the Hawkins High School. She was married to Walter Tegen in Kennan on January 1, 1952. She and Walter operated a dairy farm in Kennan until the time of her retirement. 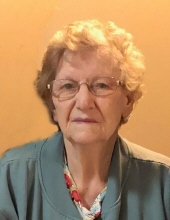 She was a member of the Zion Lutheran Church of Kennan where she was a member of the LWML and taught Sunday School, while her children were young she served as a 4H Project Leader, and was a member of the Dusty Roads Saddle Club. While a member of the saddle club she sewed and painted club shirts and parade banners. Over the years she was active in two homemakers clubs. After their retirement she and Walter enjoyed vegetable and flower gardening, fishing, and making maple syrup. In the Winter and Spring she enjoyed sewing quilts for family and church. After their health declined she and Walter resided at Aspirus Pleasant View Nursing Home in Phillips where she loved and enjoyed interacting with the staff. She is survived by four children, Sandra (Bill) Menge, Phillips, Henry (Angela), Kennan, Charles, Kennan, and Vivian (Bob Heise) Watter, Elderon, WI; by six grandchildren, Simon, Ben, Ruth, Heather, Dustin, and Meranda; by two great grandchildren, Joshua and Michael; by two sisters, Laura Tegen, Kennan, Jenny Peterson, Mesa, AZ; by one brother, Jesse Lee (Sandy) Winter, Warren, MI; and by four sisters-in-laws, Connie Winter, Wausau, Iris Winter, Apple Valley, MN, Faith Winter, Florida, and Evelyn Heise, Madison. She was preceded in death by Walter, her husband of 65 years, on July 25, 2017; by one son, Harvey; by six brothers, John, Harry, Shirley, Donald, Ray, and Roy; and by two sisters, Jean McKittrick and Flora Miller. Memorial services will be held at 11:00 A.M. on Saturday, April 6, at the Zion Lutheran Church in Kennan with Pastor John Trewyn officiating. Friends may call at the church on Saturday from 10:00 A.M. until the time of services. Inurnment will be in the Kennan Cemetery in Kennan. The Heindl Funeral Home in Phillips is assisting the family with funeral arrangements. To plant a tree in memory of Elizabeth Ann Tegen, please visit our Tribute Store. "Email Address" would like to share the life celebration of Elizabeth Ann Tegen. Click on the "link" to go to share a favorite memory or leave a condolence message for the family.